Back Training Like A Beast! Muscle-Specific Hypertrophy Workouts! Be a beast and use this specialized back hypertrophy workout. Build a huge back and learn a little anatomy while you are at it. Get ripped now! Workout includes pull-ups, cable rows, deadlift and more. There are two large muscles that cover almost the entire back. They are the trapezius and latissimus dorsi. These two prominent superficial muscles together extend from the skull all the way down to the sacrum and illium. There are also three smaller muscles, which lie deep to the trapezius and latissimus dorsi, which assist these larger muscles. The trapezius is the easily distinguishable superior muscle of the neck/back. It is divided into three different groups: the superior fibers, middle fibers and inferior fibers. Because of the many origins/connections of the trapezius, each of these areas of fibers performs a different action. As a whole, the trapezius upwardly rotates the scapula. Individually, the superior elevation the scapula, the middle fibers retraction the scapula, and the inferior fibers depress the scapula. The trapezius will be targeted with the deltoids. This large muscle of the back originates from the lower six and all the lumbar vertebrae as well as the iliac crest via the thoracolumbar fascia. All of the fibers insert on the medial lip of the intertubercular groove of the humerus. The actions of this muscle are to extend, adduct and medially rotate the arm. Unlike the pectoralis major, the latissimus dorsi can hyperextend the arm. The three muscles deep to the trapezius and latissimus dorsi share a similar function and will therefore be considered together. The most superior of the three deep muscles to the back is levator scapulae. The levator scapulae originates from the transverse processes of the first four cervical vertebrae and inserts on the superior angle of the scapula. The next muscle, inferior to the levator scapulae, is the rhomboids minor. It originates from the last (7th) cervical vertebrae and first thoracic vertebrae and inserts on the medial border of the scapula. The last, and most inferior muscles of the three is the rhomboids major. It originates from the spinous processes of the second-to-fifth thoracic vertebrae and inserts on the medial border of the scapula, below the rhomboids minor. The primary functions of these muscles are elevation and downward rotation of the scapula. The rhomboids also retract the scapula. 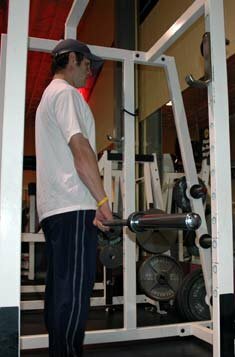 Rack deadlifts are partial deadlifts done with the bar starting at around knee height instead of on the ground. The full deadlift is a total body movement that hits every muscle in the body. 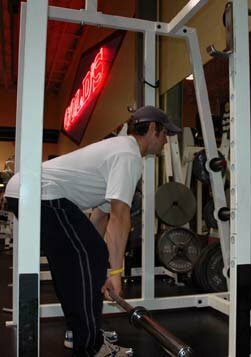 By starting with the bar at knee height, you decrease the amount of lower body (the legs) involvement in the movement because your knees and hips are not flexed as much in the starting position. The muscles in the legs will still be stressed during rack deadlifts, just not to the degree they would be from full deadlifts, which allows you to lift a HEAVY load with more tension on the muscle of the upper body, including ALL the muscles of the back. These exercises are viewed as the "supporting cast" to deadlifts. Form should be relatively strict and you should pull with your lats, not your arms. The 1-Arm variations of these exercises hit the muscles of the back a little differently and add to the development of the back. Pull-ups (not chin-ups) are a great exercise for developing the lats, specifically back "width." As you execute each rep, you should focus on pulling your body up by using your lats NOT by using your arms. Often times people will swing their body and use momentum to complete their pull-ups, which requires heavy recruitment of the biceps and decreases the recruitment of the lats. The goal is to keep the tension on your lats. One way to limit bicep involvement is to think of your hands as hooks. You are not pulling from your hands, but rather from your lats. Think of the tension from the weight starting deep in your lats and moving "up" the lats to where they insert into the humerus (bone of the upper arm) as you pull yourself up. As you pull your body up, your elbows should come to your sides and you should contract the muscles of the back, squeezing them together. 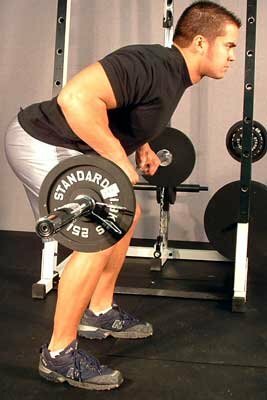 Bent over rows are used to add "thickness" to the back. Just as with pull-ups, you must focus on pulling the weight with your lats and not your arms. If you feel your form is sloppy or your arms are being heavily recruited, try decreasing the weight on the bar. As you pull the bar up, you can pull it to your lower chest, mid-stomach, or lower stomach. Where you pull to the bar to will depend on which spots allow you personally to hit the lats the hardest.